The name of this design originates from the 18th century expression “All ship-shape and Bristol fashion” which has little to do with the Bristol orphan houses whose style of needlework inspired this sampler. The orphanages were founded by George Muller, a German minister and philanthropist, who arrived in England in 1829. Muller opened his first orphanage for 30 girls in 1836 in the St Paul’s area of Bristol in western England. 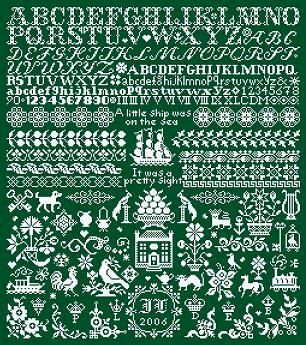 The Bristol sampler style is recognised easily as originally they were worked in red cotton thread and no corner of the material was ever wasted. The top portion consisted of a variety of alphabets, numerals and border patterns. The remainder was made up of numerous small decorative motifs such as birds, insects, animals, crowns, flowers, corner patterns etc.